Treatment of skin cancer is aimed at removing the entire lesion to prevent it causing local tissue destruction and disfigurement, as well as to prevent it from spreading to other parts of the body. 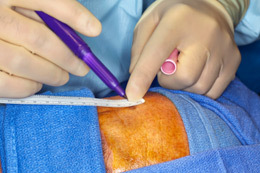 Most skin cancers are treated by surgically removing the lesion and then repairing the wound. Occasionally medical treatments are used where a cream is applied by patients at home to early or non-invasive skin cancers. The majority of skin cancers are able to be managed through our rooms at the centre. Where a skin cancer has not been able to be removed surgically, then alternative treatments may be used. This includes radiotherapy as well as chemotherapy and these treatments are offered at specialised hospital cancer care centres.